After gaining a doctorate in chemistry from the University of Birmingham John worked initially as a chemist in the plastics industry. Later, becoming a chartered management accountant, he was a finance director in manufacturing later moving to the service sector (passenger transport) where he became MD in the largest independent operator in the West Midlands. From 2000-2008 John was a member of Council at the University of Birmingham. He retains strong links with the University as chairman of two companies, a member of Court, chairman of the Defence Studies Dining Club and chairman of the support staff pension scheme. In 2009 John was appointed non-executive director of Birmingham Community Healthcare NHS Trust. 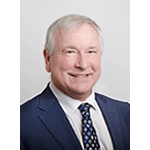 John has served as a director or chairman of various charitable organisations and is a member of the Lunar Society and Birmingham Civic Society. He is the chairman of the governing body at Bishop Vesey’s Grammar School. Awarded an honorary doctorate by the University of Birmingham in 2015.